The museum is situated on the site of the legendary musician's home, which he purchased in 1975. This house, featuring 19th-century architecture, was Marley's home until his death in 1981. It was converted into a museum six years later by his wife, Mrs Rita Marley. The main museum displays Marley's personal treasures. The property also features a well-equipped 80-seat theatre, a photographic gallery, and a gift shop selling T-shirts, posters and CDs and other Bob Marley memorabilia as well as items from Jamaica. You can also tickle your palate with sumptuous meals from the Legend Cafe. The venue allows you to see every aspect of the life of Bob Marley. 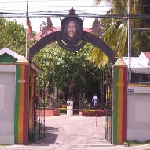 The Bob Marley Museum welcomes both locals and visitors from overseas.The entry fee is US$20.00 for non-resident adults and US$10.00 for non-resident children. Residents pay JM$500.00 for adults and JM$250.00 for children. The tour is guided and is approximately 1 hour and 15 minutes in duration. The Museum is open Mondays to Saturdays and is closed on Sundays. The first tour begins at 9:30am and the last tour commences at 4:00pm. Our tour customer support specialists are ready to assist you Monday - Friday. Please email us or call us to speak to a tour specialist.